Which categories does the great Kobe Bryant lead the Lakers? Which Categories Kobe Leads the Lakers in? Kobe Bryant is arguably the greatest Lakers player ever. The only ones that can come close are Jerry West, Magic Johnson, and Kareem-Abdul Jabbar. Magic and Kareem have the same amount of rings with the Lakers as Kobe, five, and West has only one. Jerry West has the flair of being the NBA’s logo, and one of the best players in the history of the sport. Kareem is widely considered top 10 players, and Magic is the one that made ShowTime possible. But none of them gave the Lakers as much as Kobe. 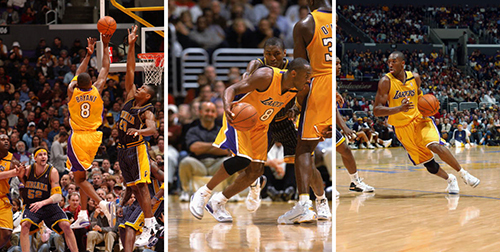 Bryant played 20 seasons in the NBA, all wearing the purple and gold. Magic Johnson played only 13 seasons in the league (all for the Lakers). Lakers Ticket Prices Keep Raising After Kobe Bryant Announcement Retirement. When Los Angeles Lakers Kobe Bryant announced he would be retiring after twenty years in the NBA it caused a huge spike in not on Los Angeles Lakers game ticket prices it caused of fury of higher NBA ticket prices across the league. The last game of the Lakers 2015-2016 regular season will feature the Lakers and Utah Jazz at the Staples Center on Wednesday April 13th at 7:30pm. Before Kobe Bryant announced his retirement there was speculation that his might be his last season with the Lakers as well as the NBA and the median listing price of a ticket for the April 13th game was $350.00. Since the announcement the median ticket price as climbed to $1325.00 per ticket an increase of 278.57%. Before the announcement of Kobe Bryant retirement the get-in-price (also known as the cheapest ticket) went from a prior announcement price of $115 to a post announcement of $571 to a current price of $825 per ticket. An increase of 617% in Lakers ticket game prices to get in the door. The Oklahoma City Thunder will be the last road game during the Los Angeles Lakers 2015-2016 season. The median ticket prices for the Thunder versus the Lakers on April 11th prior to Kobe Bryant announcing this retirement was $195 per ticket and spiked up to $422 per ticket a 245% increase. Teams such as the Milwaukee Bucks saw a an median increase of almost 97% raise in Bucks versus Lakers ticket prices for their final meeting. Lakers Ticket Prices Keep Raising After Kobe Bryant Announcement Retirement and with avialbity of tickets it looks like there is no ceiling in Los Angeles and the prices to see Kobe Bryant in Purple and Gold one last night. Get $15.00 off your order of $100.00 or more on Laker Tickets Use code LAK1980 at checkout! Barry’s Ticket Office is located caddy-corner from the Staples Center inside the Luxe Hotel. Although Lakers tickets prices keep rising there is still a chance to see Kobe Bryant play at least one more time before he retires. One of the best ways to get cheap Lakers tickets is to purchase tickets on the day of the game. Even waiting till close to or after tip off. Tickets are a commodity and after the game they are just pieces of paper so depending on availability this might be the best way to get cheap Lakers tickets. You can start checking around online that day. While you will see hundreds of sites all selling Lakers games your best bet is to look for ticket agencies located in the Los Angeles area as they will have physical stock of tickets. The majority of online brokers share a ticket feed. You can also check craigslist or ebay as well, because once the game begins the tickets can be worthless so people may want to sell just to get out of them. Barry’s Tickets may change, add, suspend, cancel, remove or otherwise modify the services, contests or promotions or discounts offered by Barry’s Tickets and Barrystickets.com at any time without prior notice. In the event that any changes are made, the revised terms and conditions shall be posted on this website immediately. Please check the latest information posted here to inform yourself of any changes. Barry’s Tickets offers all games on the NBA Schedule! All NBA tickets are guaranteed to be 100% authentic and delivered on time. Don’t miss any of the Lakers action in December. Get your guaranteed authentic tickets today! Our Lakers tickets discount code is valid on tickets marked BV only and is good while supplies last. Barry’s Tickets is not affiliated with the Los Angeles Lakers. In recent years, the downfall of the Lakers has helped the Los Angeles Clippers become the team of LA. However, according to Laker ticket prices, the Lakers still hold more value in the City of Angels. The team has announced the prices of the tickets for the 2015-2016 season, and the prices have risen to 6.2% compared to the average price of last season. 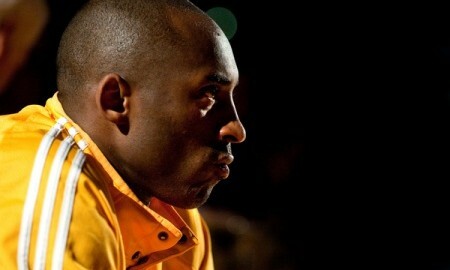 But the higher price should be expected; given that next season could potentially be Kobe Bryant’s last season. Hampered by injuries the last two seasons, Lakers great Kobe Bryant says he is finally healthy and ready to withstand the wear and tear of a full season. The star shooting guard will have minute restriction during the season, but even 25-30 minutes of action from Kobe is more than enough to entice Lakers fans and Hollywood A-listers to attend the games. The numbers speak for themselves; the tickets for the 41 home games for the Lakers at the Staples Center are more expensive than last year. The average secondary market price is set at $246.95 at the moment, and the price might go even higher as the year progresses. Teams are not immune to increasing prices during the season, and that especially might apply if the Lakers win more games than they lose and suddenly compete for a playoff spot. Last year, the average price of the secondary market tickets was set at $232.55. Many people believe that no matter that the Lakers play in a highly competitive Pacific division that is slowly becoming a rival to the Northwest for the toughest western division, other factors contribute to the increase in price. The first and most important factor are the return of Kobe Bryant, who should be back in uniform after suffering a season-ending shoulder injury in January last season. Back then, Kobe Bryant said that his plan is to be ready for September and training camp. Aside from the return of Kobe Bryant, the Lakers will also welcome rookie D’Angelo Russell, for whom the city has high expectations. Add in the return of another lottery pick in Julius Randle, as well as additions like Roy Hibbert, Brandon Bass, and Lou Williams, and the city has high expectations for next season. As expected, the most expensive game the Lakers will play at the Staples Center is against the Cleveland Cavaliers. The rivalry between Kobe Bryant and Lebron James is one of the most anticipated in the past ten years, and fans were always expecting that the two will meet in the Finals. Sadly, that hasn’t happened, but their duels are always primetime. The two teams will play at the Staples Center on March 10, and the tickets are currently priced at $397.23 for a secondary market average. The price is 60% higher than the season average for Lakers tickets. The cheapest Laker tickets for the March 10 game is priced at $86. The second most expensive game is the Christmas matchup with the Clippers, the intra-city rival. The price for the Lakers Games in December Christmas matchup that has the Lakers as the official host of the Clippers is $383.68. On April 6, the two teams will again meet, and the Lakers will again be the host. 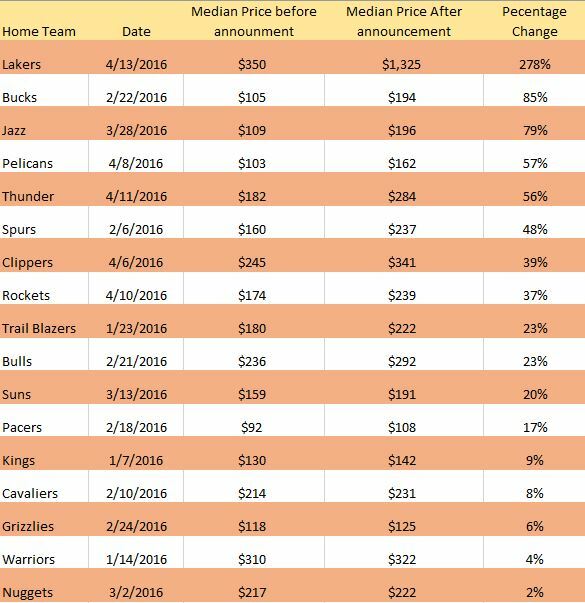 That is the third most expensive home game for the Lakers with a price tag of $336.05 for the secondary market average. Few games will have a price below $200 for the next season, and the cheapest game the Lakers will play against the Denver Nuggets. The two teams will meet on November 3, with the average price of tickets standing at $173.05. The cheapest ticket for the game costs just $23. Some other below $200 games include the duel against the Indiana Pacers (November 29, $192 average price), against the Portland Trail Blazers (November 22, $194 average price) and against the Charlotte Hornets (January 31, $198 average price). Don’t miss any of the action! Barry’s Tickets offers the largest physical assortment of the regular season and Los Angeles Lakers Playoff tickets on the web and in person. Barrys Tickets offers seats to match all budgets including Lakers Courtside Tickets, Lower Level, Premiere Level, 200 & 300 level tickets as well. Barry’s Tickets can get you in the game even if its last minute! Should Kobe Bryant Retire Soon? Should Kobe Bryant Retire Soon? Charles Barkley Thinks So! Kobe Bryant has been a controversial figure throughout his basketball career, but regardless of how you feel about his personal decisions, there is no question that he is a superstar on the court. Many would argue that whenever Kobe Bryant retires he will be one of the top 10 basketball players to ever play the game. However, no matter how great he is, he simply can not play forever. There is already speculation about how much longer Kobe can continue to play in the NBA. Recently, basketball legend Charles Barkley voiced his personal opinion about how much longer Kobe should play basketball, and in a statement that is sure to anger fans of the Los Angeles Lakers and Kobe Bryant, he expressed his desire to see Kobe Bryant retire at the end of this season. If you have a dream of seeing Kobe Bryant play in person before he retires, this may be the year to secure some tickets to a Lakers game. Barry’s Tickets has no service fee’s or hidden charges on any Laker Tickets! 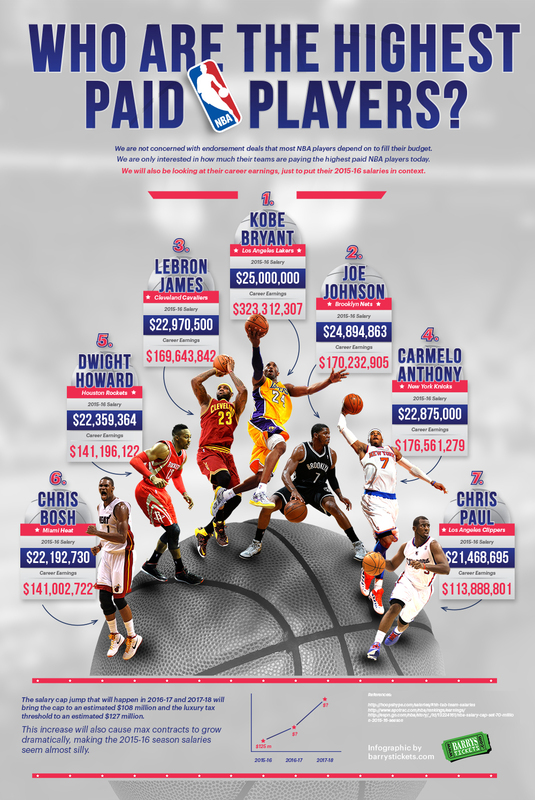 This week, we bring you our NBA 2015-2016 Infographic! During the off-season, we have the season we have heard of many rumours of trade-offs and contract negotiations of key NBA basketball players. If you missed out on this, don’t fret – check out our infographic below! There, you’ll find a great visual representation of the confirmed top 10 highest paid players and their career earnings to date. This season will be a record year for the salary cap, with the 2016-17 season looking to jump even more. If you don’t want to miss another second of the action, Barry’s offers NBA season tickets that will cater towards all budgets. Check them out here now. Coach Byron Scott said that he envisions Kobe Bryant spending more time at the SF position than playing his natural SG position the following season. While that might be beneficial for both the Lakers and Kobe Bryant, the move carries some risks, but also rewards. Here some of the Pros and Cons of the Los Angeles Lakers playing Bryant at the 3. Playing Bryant at SF allows the Lakers to have multiple ball handlers in their lineup. Additionally, they will have a quality player on each position in the starting lineup. If Bryant starts at the 2, the Lakers are left with Ryan Kelly or Nick Young beginning at 3. Playing Bryant at SF will also allow the Lakers to start both D’Angelo Russell and Jordan Clarkson. Both can create and initiate the offence, and Bryant will be relieved from those duties, something he had to do in the past two seasons. Playing Bryant at the SF position also allows Bryant to preserve energy on the defensive end, where he won’t have to chase shooting guards through many screens. Playing SF also puts Bryant closer to the post, where he is most effective, playing at the elbows and using his footwork and post-game to punish opponents. The Lakers have tried playing Bryant at the SF previously, in the 2000-2001 season, and in 2012-2013. In both cases, the Lakers had an abundance of players playing at guard positions. If Bryant is moved to the small forward position, he becomes the de facto best wing defender the Lakers have. In previous seasons, the Lakers have used a small forward as a designated wing defender to preserve Bryant’s energy for the offensive end. That was the case with Ron Artest (Metta World Peace) and Trevor Ariza. If Bryant plays at the 3, he will have to defend Cleveland Cavaliers Lebron James, OKC Thunder Kevin Durant, New York Knicks Carmelo Anthony, Kawhi Leonard and others. In reality, some of them will spend time at the 4 in small ball lineups, and there are not as many quality small forwards nowadays. Another downside of playing Lakers Kobe Bryant at SF is that it reduces the Lakers depth. While they will get to have their five best players on the floor at the beginning of the game, they have only Lou Williams and Nick Young to serve as backups to positions 1-3. Not that the Lakers have some better options at the SF position. Another downside of playing LA Lakers Kobe Bryant at the Small Forward position is that it carries risks for his health. Bryant is not exactly the model for fitness in recent years, and banging inside with bigger and stronger opponents does carry certain risks. If the Lakers elect to play Bryant at the three more and give reins of the offence to the young backcourt, they risk the turnover-prone offence territory. Clarkson and Russell are great young players, but they do not have the experience to run an offence. Russell averaged almost six turnovers per game during Summer League, but that is to be expected. But most importantly, the change could and probably will put Lakers Kobe Bryant in a secondary position. Kobe has served as the de facto unquestioned face of the franchise for so many years, and allowing Clarkson and Russell to run the show might not fare well with his ego. Don’t miss any of the action! Barry’s Tickets offers the largest physical assortment of Lakers Tickets during the regular season and Los Angeles Lakers Playoff tickets on the web and in person. Barrys Tickets offers seats to match all budgets including Lakers Courtside Tickets, Lower Level, Premiere Level, 200 & 300 level tickets as well. Barry’s Tickets can get you into the game even if its last minute! Kobe Bryant or Lebron James Who Will Cost You More? The discussion which player is better, Kobe or LeBron is one that can never end. While there are similarities between the two, one of them is a shooting guard, while the other is a small forward. Therefore, their style of play is different. But one thing they have in common is their popularity. Kobe is one of the most popular athletes in the NBA, and LeBron got there the past few seasons as well. LeBron proclaimed himself the King, even before he stepped a foot on an NBA court, and signed a multiyear deal with Nike. There are two aspects to consider when considering who is more valuable moneywise, and those are ticket prices for away games, and attendance for both home and away games. The Lakers are a mess this year, but people still want to see Kobe Bryant. One of the aspects to compare is who brings more fans to the arena. According to ESPN statistics, the Cavaliers are second on the list for average attendance at home games. They fit 20,562 visitors to their games, or on average 100% of the capacity of the arena. In the 2013-2014 season, the one before LeBron joined, the Cavs ranked 16th in home game attendance, with an average capacity of 84.3%. Cleveland is also the only team in the top 10 in attendance, to have a higher percentage on the road than home. The Cavs percentage for away games is 100.9. The Lakers are 10th on the attendance list, with an average of 18,940 visitors in the arena, or 99.4%. Their away games fill 93.3% of the capacity. The Warriors are the hottest team in the NBA and is traditionally one with high prices for tickets. The starting price for tickets when Lakers are in town for this year is $97, with $165 being the average price. The Golden State Warriors routed the Lakers in both duels they already played this season. When LeBron comes to town, the starting price is $151, a lot more than what it was last year, when the price was $62 per ticket for the lowest price. The average price of tickets for the game at Oracle Arena is $240. The duel between Kyrie Irving and Derrick Rose will cost $154 for the lowest priced ticket, and $189 on average. This is one duel where LeBron might not be the central figure, but he is responsible for the higher price of the ticket. Even on Christmas day, when the Lakers visit the Bulls, the price is significantly lower, starting at $94, and going up to $132 on average. Dallas is probably one city where the price for watching Kobe Bryant in living is higher than the one for LeBron James. Tickets start at $52 when the Cavs are in town, and the average price is $72. While the difference is not big, the tickets for Kobe are more expensive, and understandably so, since Lakers are rivals with the Mavericks. The duel between the two teams will cost $61 at the lowest, and $88 for an average ticket price. Fans will have to pay at least $94 if they want to see LeBron James in person, and the average price is $172. For Kobe, the player that dropped 81 points on the Raptors, fans need to pay $73 for the lowest priced tickets, with average price being $102. Even though New York is one of the worst teams in the league, ticket prices are high. Both James and Kobe have had some masterful performances at the Garden. Bryant holds the record for most points scored in the Garden. In 2009, he scored 61 points in a Lakers victory. This year, the tickets for the Lakers start at $110 and cost $204 on average. James is third on the list for average points in the Garden, right behind Kobe. When his Cavs come into town, fans will pay at least $132 to see his duel with Carmelo Anthony and $245 on average. Memphis has some of the lowest priced tickets in the league, which provides fans in the town to see their team and opposing stars in person for a low price. For example, the tickets for the duel with the Lakers, scheduled for March 6 start at $18, with the average price being $74. The starting price for the duel with the Cavs is higher and set at $54, but the average price is lower and is $61. The Purple and Gold come out strong in support of Kobe and the Lakers. The Clippers vs Lakers game is on January 7th and has a $75 get in price while the Clippers vs Cavaliers January 16th is 33.3% higher to get in the door at $100.00 per ticket. To sit in the section 209 row 9 for the Lakers will cost you $135 while the same ticket for the Cavs game is 22% higher at $165 a ticket and finally if you wanted to sit in section 111 row 3 (Center Court) for the Lakers game would run you $600 per ticket and for the Cavaliers expect to pay 62% more at $975 per ticket. Don’t foget that the Clippers and Lakers do play each other 3 more times at the Staples Center than the Clippers play the Cavs. The number six reason to Visit Staples Center? 6)Time is running out to see one of the basketball’s elite players, Kobe Bryant, and the Staples Center just happens to be his place of employment. He may be knocking on retirement’s door, but watching him play is still a sight to be seen! The number five reason to Visit Staples Center? 5)If you’re heading to a Lakers game, grab your camera for a shot of Jack Nicholson. He’s a long time fan of the club, and can typicallycourtsidebe found . In fact, he has owned his Lakers court side tickets for more than three decades, which makes him the NBA’s most dedicated fan! Plus, he’s just one of the many celebrities you’ll have the chance to gawk at during a Lakers game. The number four reason to Visit Staples Center? 4)In 2000, the Staples Center was named “Best New Concert Venue of the Year” by Pollstar Magazine. It also won “Venue of the Year” in 2000 and 2001. This is no surprise considering it has hosted some of the biggest events. The arena boasts an impressive resume that includes Michael Jackson’s memorial, Bruce Springsteen, Justin Timberlake, Beyonce, LA Kings Stanley Cup Finals, UFC fights, 2000 Democratic convention, figure skating championships, LA Lakers NBA Finals, Grammy Awards, and many more high profile events. The number three reason to Visit Staples Center? 3)If anyone knows anything about being vegetarian, it’s People for the Ethical Treatment of Animals (PETA). 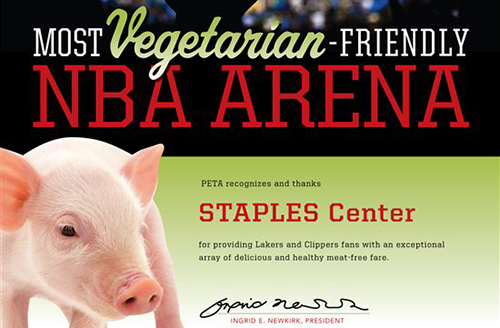 In 2013, the organization named the Staples Center the most vegetarian-friendly NBA arena. So, if you’re vegetarian, you don’t have to worry about packing your lunch when buying tickets for an event here! The number two reason to Visit Staples Center? 2)Celebrities and fans come to the Staples Center to see the biggest acts in the world perform and no one has performed more than Taylor Swift. 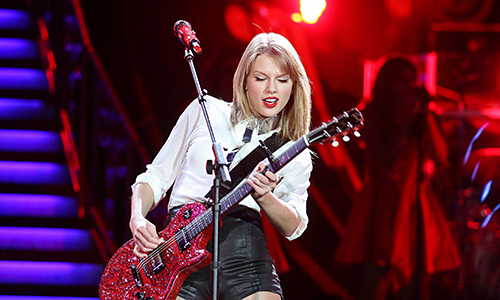 Taylor Swift has sung at the Staples Center 18 times including sold out concerts, five different times at The Grammys and the MTV Video Awards. Taylor Swift will add to her lead over U2 who has performed at the Staples Center 13 times when she plays there on August 25th and 26th in 2015. The number one reason to Visit Staples Center? 1)Athletes attract Stars! Besides Jack at any given Lakers game you can usually spot many A listers sitting courtside from David Beckham, Chris Pine,Tom Hanks, Jason Bateman, Stallone, Tom Cruise, Joseph Gordon Levitt, Zac Efon, Denzel Washington and the list goes on and on. There are plenty of Celebrities at Clippers games to from Sir Paul McCartney, Drake, Rhianna, Justin Bieber, Mark Walberg, Drew Barrymore, Jessica Alba and who can forget Ashton Kutcher and Mila Kunis on the Kiss Cam. Barry’s Tickets is located just minutes from Staples Center! What’s the plan after Kobe retires? Kobe Bryant is one of the league’s greatest players of all-time. He is entering his 19th NBA season this fall and has been to the All-Star Game 16 times in his illustrious career. Tack on five NBA Championships, two NBA Finals MVPs and one regular season MVP and Bryant is a surefire Hall-of-Famer. The past two years have been rough for the 36-year-old though. He has suffered two serious leg injuries including a torn Achilles and a fractured knee. To make matters worse, the Lakers are coming off a season in which they won only 27 games, and things don’t look much better this year unless vintage Bryant comes back. With a poor supporting cast and an ageing star coming back from serious injuries, the Lakers don’t appear to be building for the future or winning in the present. Bryant is expected to retire in two years, and the summer of 2016 has several NBA games starts becoming available in free agency. The Lakers are hoping some of those stars can get past the losing ways of recent and head to the attractive destination of Los Angeles. Last season, Bryant was coming back from a torn Achilles and all signs pointed to him being physically beautiful. The Lakers were coming off a summer in which Dwight Howard bolted town for the Houston Rockets, but if Bryant was healthy, they were expected to be in the playoff hunt. He struggled initially coming back from injury just because he hadn’t played in game action for a while. In his 10th game of the year, though, he went down with a fractured knee and the Lakers season went up in flames. Add in injuries to Pau Gasol, and Steve Nash and Los Angeles were trotting a team of street free agents on the court. The results weren’t good. This offseason, they re-signed Jordan Hill to a two-year deal and drafted University of Kentucky big man Julius Randle with the seventh overall pick. The cupboard is still quite bare though and asking your ageing superstar to turn back the clock and win games on his own after the devastating injuries he’s suffered unrealistic. Los Angeles has always gotten by on their team history, spotlight, and beautiful weather in Southern California. Free agents loved that about the Lakers. That doesn’t appear to be the case anymore. Howard and Pau Gasol have left town during the last two offseasons. Unless Randle becomes a star in the next two years, it’s hard to expect any prominent free agents to come to town because the Lakers aren’t an attractive winning destination. Kevin Durant, Joakim Noah, Al Horford, Nicolas Batum, Brook Lopez and Mike Conley are among the free agents that will hit the market in the offseason of 2016. Fellow Cleveland Cavaliers LeBron James and Kevin Love could even hit the market if they opt out of their contracts. The summer of 2016 is gearing up to be one of the best in recent years, and the Lakers will have plenty of cap room. However, without a plan for the future in place and the ability to win immediately, they may have to settle for the remaining free agents. Learn more about where the Lakers home games are played at. No matter what the next two seasons are going to be interesting ones for the Los Angeles Lakers, Lakers Fans and Kobe Bryant himself! Chris M.
The Los Angeles Lakers are entering a 2014 – 2015 season full of mysteries and question marks. Will this be the season the Lakers will manage to bounce back? Will Kobe be back at his 100 percent and how will the new stars of the team end up performing? Let’s have a look at the most significant games of the 2014 – 2015 regular season for the Lakers. You can purchase Lakers Tickets for all games at the Staples Center. Barry’s Tickets has been serving Los Angeles and Lakers Fans since 1985. Open 7 days a week, 10am – 9pm, for pickups. Update: The you can now purchase Lakers Tickets for their entire 2014-2015 schedule. You can follow Chris Cabrera on G+ or Twitter for tiny bits of wisdom.